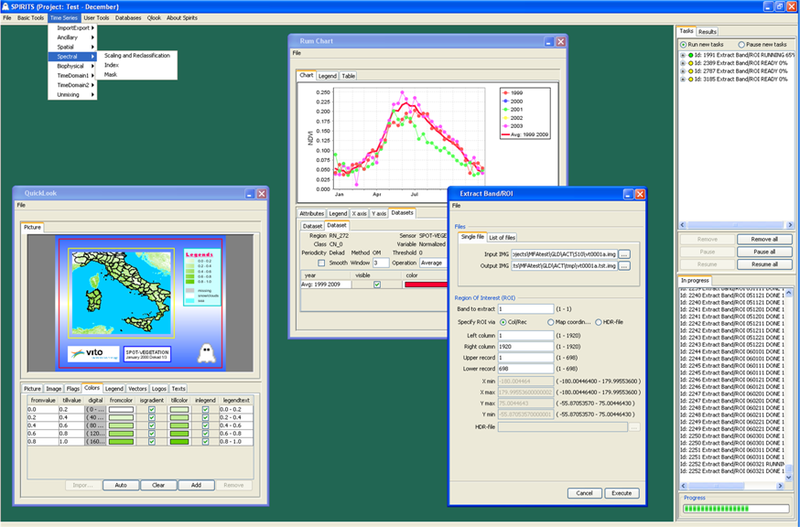 The JRC-MARS unit (Monitoring Agricultural ResourceS) develops methods, tools and systems to monitor agricultural evolutions (areas and yields) in Europe and the major food producing areas around the world. Celebrating its 25th anniversary, we highlight the goals and achievements of this MARS programme, and the broader role of agricultural monitoring to support global food security. Since 2000, VITO delivers remote sensing data which contribute to better crop yield forecasts. Given the post-war food scarcities, agriculture has always been a major focal point of the European Union. DG-AGRI, the European Ministry or “Directorate General” (DG) of Agriculture, is responsible for the definition and realization of a Common Agricultural Policy (CAP) amongst all the EU Member States.To take adequate and fair decisions, DG-AGRI needs reliable agro-statistics, acquired in a uniform and timely way over the different EU member states. This action aims to determine the per-annual areas of the major crops within the EU. Within-season yield estimates are of crucial importance for the world trade of food commodities. 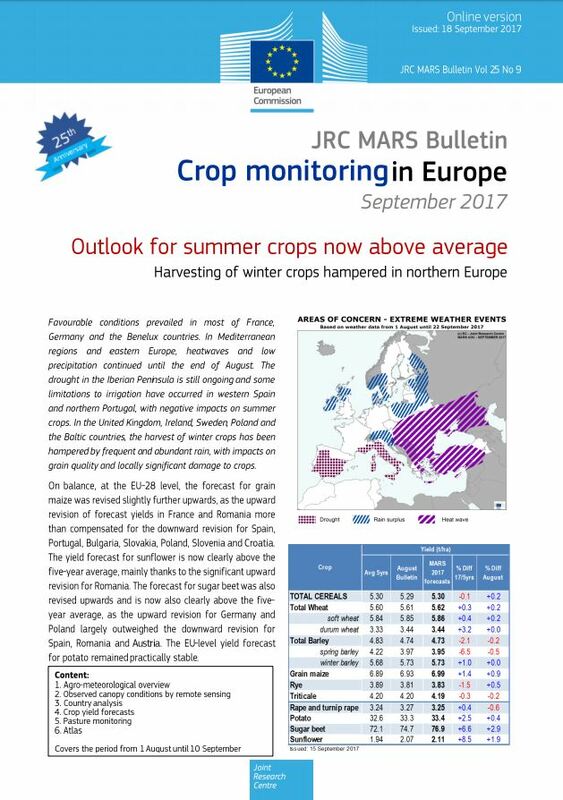 JRC-MARS provides this information on a European or global scale, via a combination of different resources (weather data, crop growth modelling, remote sensing, etc.) and distributes it to the major stakeholders around the world. The previous results (areas, yields) are used to deal with other issues, such as crop insurances and the impact of climate change. Although VITO is active in the above three domains, within the so-called MARSOP contracts we only deliver remote sensing data for the second activity. For this pre-harvest monitoring and yield estimation action, we collaborate with Meteo-Group (Germany) and Alterra (The Netherlands). 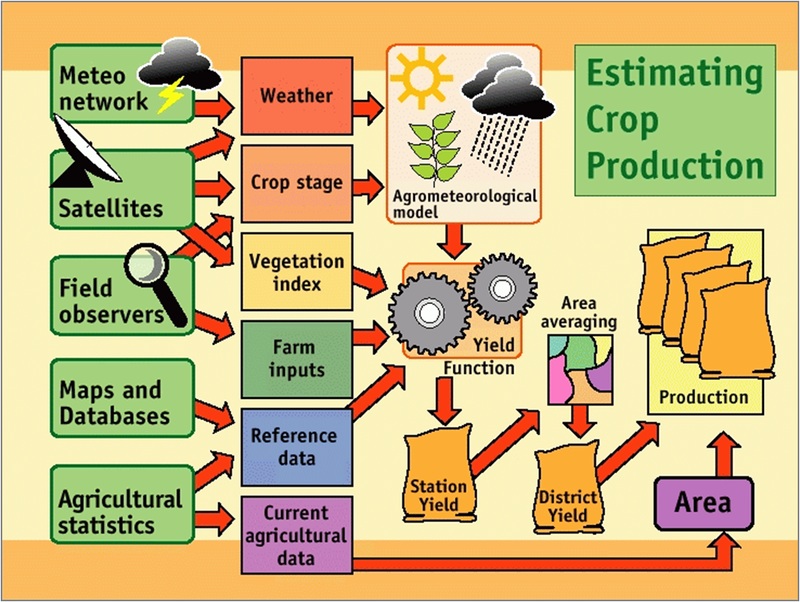 The core of the JRC-MARS yield forecasting system is based on “models”: crop growth models or statistical methods. Both have the tendency to narrow down on the “normal behaviour”, but they often fail in the case of exceptional events. According to JRC, the “objective observations” of remote sensing often improve the final yield estimates. In this way, the MARS project paved the way for many other projects and collaborations. Besides the various pre-processing workflows which upgrade the “raw” satellite registrations into 10-daily composites (S10), two software packages have been developed with focus on the further extraction of useful information from time series of such S10 composites. FromFrom the very beginning (2000), it was attempted to program all MARSOP procedures in a most generic way. That means: operational for any sensor, resolution, indicator, etc. Over the years this has resulted in a set of ANSI-C programs called GLIMPSE, all working in Command Line mode, which facilitates their incorporation into “scripts” and the setup of automated processing workflows. Today, GLIMPSE is also used in many other projects by JRC and VITO. SPIRITS is a JAVA-based software which allows to run the core of the GLIMPSE modules in a standard Windows environment. But it also provides a wealth of additional facilities, related to format conversions, database management, map generation, etc. SPIRITS has been developed on behalf of JRC-MARS. It is freely available and the latest version can always be downloaded from http://spirits.jrc.ec.europa.eu/. SPIRITS is used around the world to prepare agro-meteorological bulletins. Find out more about the MARS programme, its history, goals and achievements in a special summary dedicated to its 25th anniversary.